Urban Hike is one of our favorite Pittsburgh organizations. 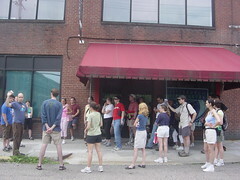 Every month or so the Urban Hike organizers plan out a hike through a different neighborhood. There is always a great crowd of people and some local experts. The hikes are free and move at a leisurely pace. There are usually some stops for water along the way and those who choose go out for some snacks at the end. We got some much appreciated technical help to more exactly pinpoint the meeting location for Sunday’s hike. Check out the Map. We are meeting at the playground in Schenley Park officially called Anderson Park (affectionately referred to as “Dinosaur Park”). If you look at the crazy intersection between Panther Hollow Road and Boulevard of the Allies, there is a spur that comes off Panther Hollow Road right at that junction. The spur ends in a cul de sac that abuts the Boulevard. There is playground next to the spur (if you go to the satellite view you should see it) and there is free parking along the road there. We will be gathering right next to the playground, where the road meets the cement path leading into the park. Check out our previous posts about urban hike here.